Ladies and gentlemen, I give you The Kingdom, or CSI: Saudi Arabia. Seriously, when everythings said and done, it feels like youve just endured a two-and-a-half-hour episode of CSI, except here the cops (besides being genii at cracking crime scenes) wipe out the bad guys with the pedigree of NAVY Seals on steroids. And its bloody, raw and nauseating, and ultimately more mundane than a SPIKE TV marathon. A mass suicide bombing has ripped apart the heart of an American community in Saudi Arabia. Word of the disaster reaches Washington and a small FBI task force (Jennifer Garner, Jason Bateman, Chris Cooper) led by Ronald Fluery (Jamie Foxx) is dispatched to investigate the bedlam. Once our heroes arrive to the desert kingdom, things get sticky when the freedoms theyre used to having are hamstrung by the Saudi National Guards way of solving crimes, which according to this movie is weak and obsolete. But the Saudi police dont budge, so the Americans take matters into their own hands. Cue the rebellion in the face of adversity. Cue the badass action. 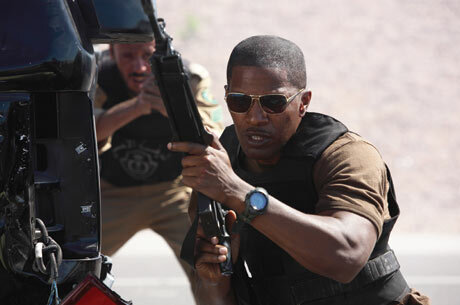 Cue Jamie Foxx spitting more sardonic one-liners than bullets. Believe me, youve seen this movie before. Youve heard this brazen dialogue and youve seen these programmed performances. As a commentary on Middle East politics and warfare, Kingdom doesnt offer anything novel. Director Berg certainly tarts up the film with wobbly camera work (looking like he blatantly stole every technique from Michael Manns book) and pulse-pounding action (which is shot in digital for some scenes, also Michael Manns M.O.) but the only ingredient that could make the film as relevant and powerful as it is in Bergs ambitious little head is innovation. Sadly, there is no trace of that here.